Our Heavy Duty Overhead Storage Racks Are Designed To Last A Lifetime! Do you have wasted space in your garage? Don’t think so? Look up! With help from Custom Garage Works, you can utilize your overhead garage space for additional storage space. 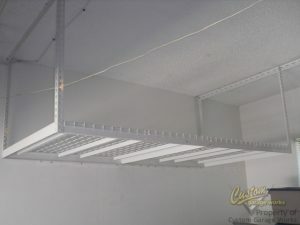 Custom Garage Works installs garage racks and overhead garage storage. We even sell the racks without installation to clients who are interested in installing their own. Our most commonly purchased garage storage rack is the 8 foot by 4 foot, which is also our best value! All of our overhead storage rack systems feature 14 gauge steel construction, electrostatic powder coated finish for unparalleled durability, and industrial strength wire decking. CGW Safe Racks & Tuff Raxs steel is thick, 14 gauge steel on the majority of the rack, and the shelving wire is the thickest gauge on the market. CGW Safe Racks & Tuff Raxs guarantees these overhead racks won’t fail for life. Powder coated for style and resiliency. 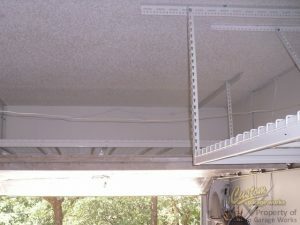 Your Overhead Garage Storage Rack Can Even Be Installed Above Your Open Garage Door! When you need high-quality overhead garage storage in Haslet and Fort Worth, TX and the entire DFW area, call Custom Garage Works at 214-494-9068 or 817-308-1305 and set an appointment. We can sell the rack to you directly, or install it for you! Our job is to make sure your garage organization works for you, and we are dedicated to customer service. We have been providing durable, top of the line garage storage solutions since 2003, and we specialize in custom garage services such as garage floor coating. We even provide solutions to other garage dilemmas, such as garage cabinets and premium garage floor coatings. Give us a call today to find out how we can help you get the garage of your dreams! Updated on September 19, 2018 at 6:42 pm by Custom Garage Works.